A 90 minute special documentary 'Soham Revisited: 15 Years On' re-examines the events that took place in the quintessential English market town in 2003. It was a story that horrified the country. 10 year old best friends Holly Wells and Jessica Chapman left a family BBQ to buy some sweets - but never came home. 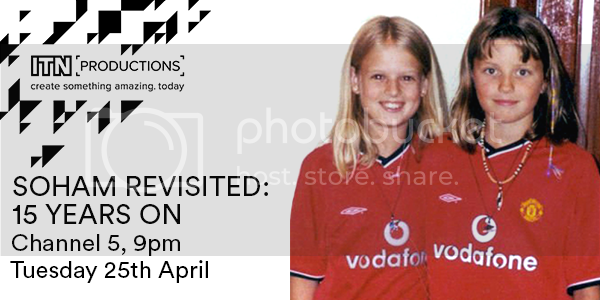 Just three and a half hours before they were reported missing, Holly’s mum took a photograph of the two happy little girls wearing their beloved Manchester United Shirts. It became a heart breaking image seared into the public consciousness. After a huge search Ian Huntley, a man they trusted and caretaker at the local school, was arrested and eventually convicted of their murders. This new documentary examines Huntley’s arrest and subsequent trial and conviction by speaking to experts and those who knew him. It looks at the crucial failings that let him get a job close to children and hears from people who helped put him behind bars. His ex-partners reveal the secrets of Huntley's past and his daughter, who never knew the truth about her father, speaks out.